Impacts and Insights of Gorkha Earthquake in Nepal offers a practical perspective on disaster risk management using lessons learned and considerations from the 2015 Gorkha earthquake in Nepal, which was the worst disaster to hit Nepal since the 1934 Nepal–Bihar earthquake. Using a holistic approach to examine seismicity, risk perception and intervention, the book serves as a detailed case study to improve disaster resilience globally, including social, technical, governmental and institutional risk perception, as well as scientific understanding of earthquake disasters. 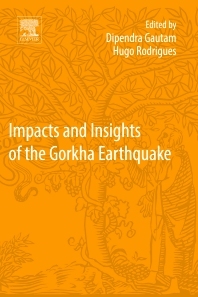 Covering the details of the Gorkha earthquake, including damage mapping and recovery tactics, the book offers valuable insights into ways forward for seismologists, earthquake researchers and engineers and policy-makers. Dipendra Gautam has been working for five years in the Nepalese disaster risk reduction sector focusing specially in earthquakes. His primary topic of research is structural earthquake engineering; previously he worked in several topics of geotechnical earthquake engineering and seismology. Apart from this, he graduated with a degree in Anthropology majoring in indigenous knowledge, which is fruitful to disseminate the ideas of local resilience. He worked for 7 months after the devastating Gorkha earthquake in Nepal. He has been involved in a research institution in Kathmandu and worked for almost 2 years as a Disaster Risk Reduction Expert. He has authored several research papers and presented quite a few works in international conferences. Hugo Rodrigues is Senior Lecturer at the School of Technology and Management, Polytechnic Institute of Leiria, Portugal, teaching several topics related with Structural Analysis, Building Pathology and Rehabilitation. He received his Ph.D. in Civil Engineering from the University of Aveiro in 2012. His experience in Seismic analysis, having participated as a team member in research and development projects, specialized consultancy studies ordered by several public institutions and companies regarding the assessment of seismic risk. His major research interests are Building Rehabilitation, Structural Health Monitoring and Seismic Safety including experimental and numerical activities. Research member of the RIsks and Sustainability in COnstruction (RISCO). He has co-authored more than 60 publications in top-tier peer-reviewed journals and contributed to more than 100 publications at national and international meetings. Nicely compiled book for structural engineers, risk reduction practitioners, and policy makers. A comprehensive account of Gorkha earthquake. Equivalent to the account of 1934 earthquake in eastern Nepal.